HiFi is now standing at Ponies on the Hill in Greeneville, TN. Please contact Jesse at 540-447-4425. Grogan's High Fidelity, aka, HiFi, is a combination of some of the finest performance lines available. He is 3/4 Irish Draught and 1/4 Oldenburg via Selle Francais, First Class by Furioso II. The irish jumping talent and movement is augmented by that of the continental warmblood while retaining the finest irish draught qualities of trainability, soundness and scope. HiFi's foals exhibit all of these traits. This dynamic stallion answers the needs of classical and contemporary performance horses with impeccable conformation, elegant, balanced movement and limitless scope over fences. A rare case of truly suitable for amateurs and professionals alike. Please contact for more information on breeding to HiFi in North America. (HiFi), is by Snowford Bellman, RID out of Reilly's Fianna RIDSH (deceased) by First Class, Oldenburg. He was presented for inspection in 2005 when he earned the highest marks awarded to any stallion on that inspection tour. He impressed with his confirmation, movement and spectacular jumping talent. He went on to win Part Bred Three Year Old and Reserve Champion Part Bred. HiFi was Champion of the entire division of irish draughts, including purebreds at Upperville in 2008. HiFi's first foal is a replica of her sire namely Tully Mac's Gold Bug. Gold Bug attended the 2007 National Irish Draught Show at the Lamplight Equestrian Center in Wayne, Il. Winning the Partbred Dressage Prospect Class, for Foals to Three Year Olds. Reilly’s Fianna represents some of the finest Oldenburg lines: First Class by the prolific stallion Furioso II out of the legendary broodmare, Chinchilla. Other notable sires from the Furioso II line include Frohwind (Furioso II ex. Windstille) currently ranked 24th by the USEF for Dressage Sires and Voltaire (Furioso II ex. 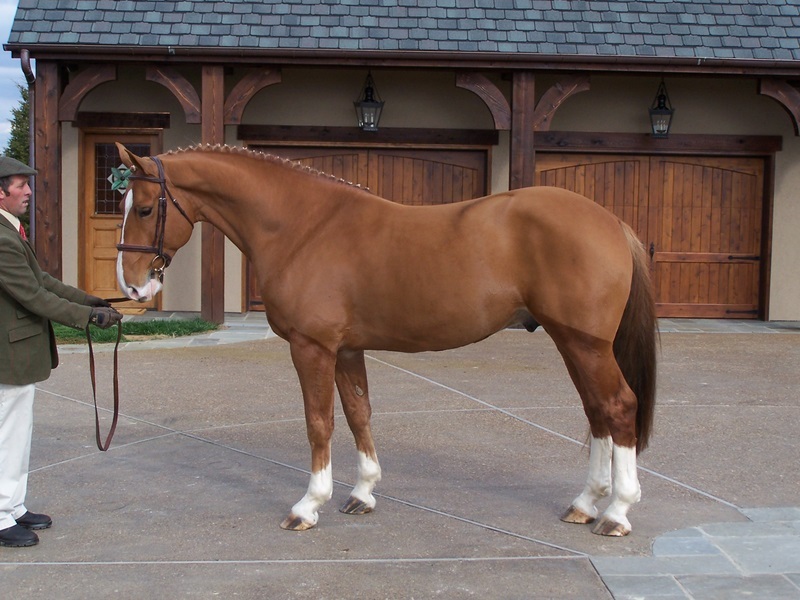 Gogo Moeve) currently ranked 34th by the USEF for Dressage Sires, 35th for Jumper Sires and 8th for Hunter Sires. HiFi appeals to even the most traditional Irish Draught breeder while his dynamic athleticism and desperate-to-please attitude promise to make him a must-have for both the performance and pleasure horse breeder. We anticipate a long and exciting career from HiFi as well as the beginnings of another legacy.